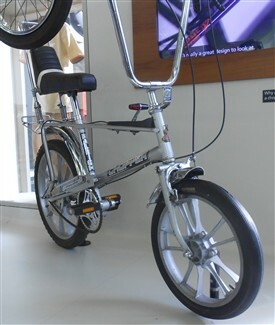 Raleigh released a special edition version of the Chopper to celebrate selling 750,000 examples of the bike. It was launched to coincide with the Silver Jubilee of Queen Elizabeth II in 1977 - and it was appropriately painted silver. The example shown here is preserved in the Museum of Transport (Riverside Museum) at Glasgow. This page was added by Website Administrator on 17/08/2016.